Mom Kris Miles and her 12-year-old daughter, Katherine, who has sensory processing disorder, enjoy a calmer tram tour with headphones and a weighted lap pad. Katherine Miles sits on the Northwest Trek tram, her face glued to the window. Like any other kid, she’s mesmerized by the fluffy white mountain goat kids squeezed onto a single log by the lake. 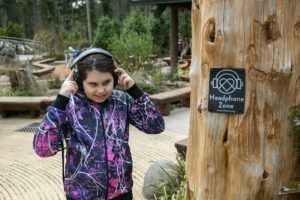 But unlike a lot of other kids at the wildlife park, she’s also nestling a weighted lap pad on her lap, and her headphones aren’t channeling anything but silence. 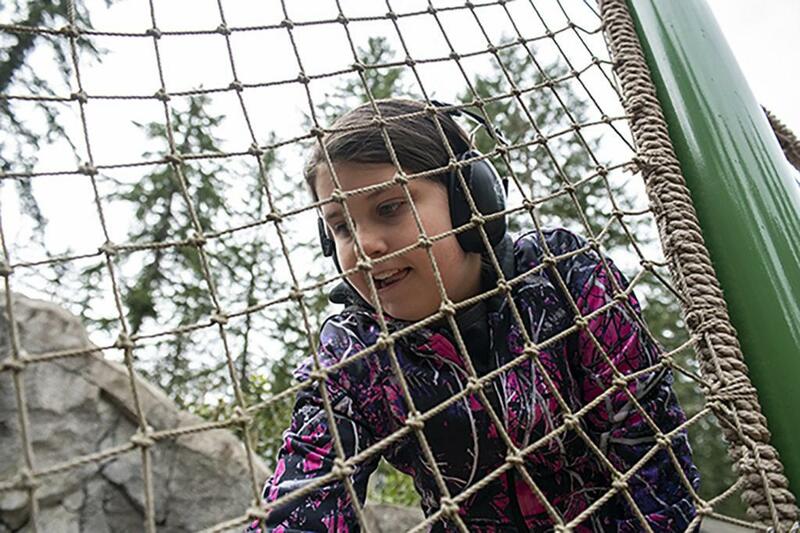 Twelve-year-old Katherine is one of the first visitors to make use of Northwest Trek’s new sensory-inclusive tools – and the difference it’s making to her Trek experience is huge. “I was like this,” explains Katherine helpfully, jumping around to demonstrate. Katherine Miles holds a blue fidget toy, which helps her stay calm and focus. Katherine was diagnosed years ago with sensory processing disorder, a condition that causes her to be extra-sensitive to sensory stimulation like noise or activity. Kris homeschools, but going to public places – especially busy ones – is challenging and unpredictable. 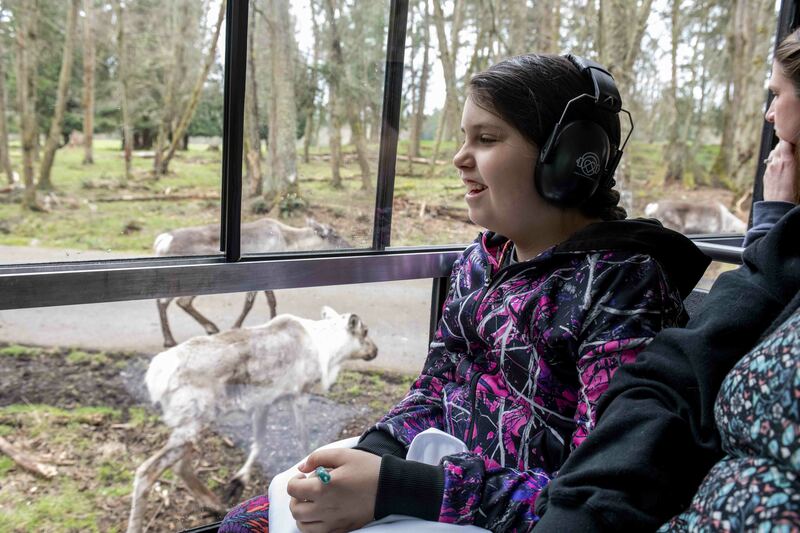 So when she heard that Northwest Trek had joined a growing group of zoos, parks and other venues that offer places and tools to be more sensory-inclusive, she was thrilled. 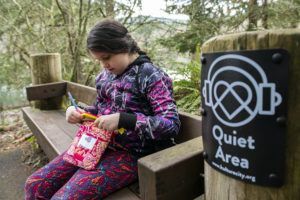 The first venue in Washington to be certified as sensory-inclusive with KultureCity, Trek now offers quiet zones around the park, as well as signs warning guests of potentially noisy areas like the Kids’ Trek playground and café. All staff are trained in helping guests with sensory needs. Katherine Miles puts on headphones at the Kids’ Zone playground. The noise-cancelling headphones help her avoid too much stimulation. “We want all visitors to have the best possible experience here,” says Gabby Huffman, the Trek naturalist who helped get the park certified as sensory-inclusive. A backpack of tools – fidget toys, headphones, a feelings card for non-verbal guests and a lanyard to self-identify as someone with sensory needs – can be checked out at the front gate. Guests can request weighted lap pads on the Discovery Tram Tour. Everything’s sanitized between uses, and completely free. 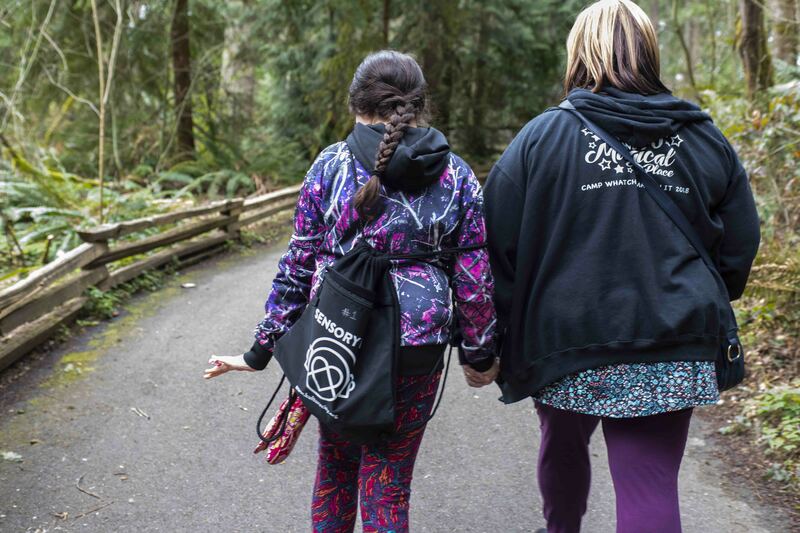 Kris and Katherine – carrying the sensory backpack – walk the trails. And it’s clear that on this tram tour, she’s drinking everything in. As the tram’s engine kicks into high gear for the uphill climb, she rocks a little but stays focused on the forest outside, and soon points out a moose half-hidden in dappled shade. Kris glances at her with instinctive watchfulness – then relaxes with a thumbs-up. The tram passes the herd of caribou, then elk, and finally the lake. “Look, there are our pair of trumpeter swans,” calls out Jess, the onboard naturalist. “Ducks too,” adds Katherine, not missing a beat. Off the tram, mother and daughter wander calmly along the trails, Katherine eagerly pointing out ferns on a log with spores exactly like the ones she’s studying in science. “My favorite animals are the snowy owl, and the wolves,” she says, face wreathed in a smile and long dark braid bouncing on a brightly-colored sweater. Katherine Miles takes a break at the Quiet Zone, a designated area fairly free of stimuli. 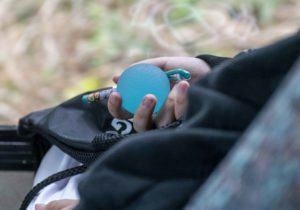 As they pause at a Quiet Zone bench on the way to the grizzly bears, Katherine takes a blue squidgy fidget toy out of the backpack. “This zone is awesome,” Kris explains. “If we’re sitting here trying to chill out and some noisy teenagers come along, all I have to do is this.” She points to the Quiet Zone sign, then puts her finger against her lips. Finally, they head for the spot that’s both fun and challenging for a social kid with sensory needs: the Kids’ Trek playground. Even on a cool spring Friday, it’s starting to fill up. But Katherine skips past the new Headphone Zone sign, whips out her headphones and runs off to play on the ropes. It’s a promise of something that’s never been possible before: visiting Northwest Trek in summer. CHECK IT OUT: You can check out free sensory bags at the ticket window, and request a weighted lap pad on the Discovery Tram Tour. Find Quiet Zones on the path to grizzlies, next to bobcats, and at the intersection of the Cat, Bear and Wetlands trails. FIND OTHER PLACES: Out sister zoo, Point Defiance Zoo & Aquarium, is also sensory-inclusive: explore it here. Find other certified venues at Kulture City. LEARN MORE: On our Sensory Inclusive page.